He was born in the city of Kashira, Moscow region. 1928 He moved to Moscow. Since childhood, I have become interested in drawing cartoons. 1945 It was adopted without exams on drawings of the war years at the Moscow Higher School of Industrial Art (former Stroganov). 1948 Engaged in a circle of young cartoonists under the newspaper Moskovsky Komsomolets. In the same year in the “Moscow Komsomol” for the first time published in print. 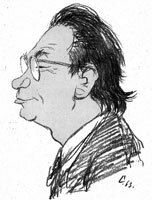 1949 – 1983 Worked as an artist in the magazine “Crocodile”, being a regular freelance editorial staff. 1949 Exhibition of satire in Moscow. 1951 Joined the Union of Artists of the USSR. 1954 – 1960 The first postwar exhibition of works by young artists of Moscow and subsequent youth exhibitions. One of the initiators of the creation of the first post-war exhibitions of young artists and a regular participant of these exhibitions. 1954 – 1966 Was elected to the composition of the board and presidium of the Moscow Union of Artists (MOSH). 1955 Group exhibition at the Academy of Arts of the USSR. 1955 – 1956 He was deputy editor of the art department of the magazine Krokodil. 1956 Participated in the formation of the magazine “Funny Pictures”, and then painted for this magazine. 1957 All-Union exhibition of works by young artists for the VI World Festival of Youth. Exhibition for the 1st Congress of Artists of the USSR. 1960 – 1980 Elected a member of the board of the Union of Artists of Russia. 1961 – 1963 Elected as the executive secretary of the board of the Moscow Union of Artists. 1961 Exhibition “5 Years of” Funny Pictures “. Exhibition of satire in the GDR. The first album of humorous hysunks “Humor” was published. 1962 Participated in the organization of the jubilee exhibition for the 30th anniversary of the Moscow Union of Artists, assisting in the strength of opportunities the chairman of the Moscow Union of Artists, D.K. Mochalsky, his deputy F.P. Malaev and the asset of Moscow artists. All-Union Art Exhibition in the Pushkin Museum. Exhibition “Circus artists” in the Central House of Artists. Exhibition of works by Moscow artists on the 30th anniversary of the creative union. Cruised to Europe: Budapest, Vienna, Italy. 1963 Personal exhibition in the editorial board of the magazine “Youth”. Exhibition of satire in Warsaw. Personal exhibition in the House of Cinema. 1964 The album of satirical drawings from a series “Masters of a caricature” is let out. Exhibition of satire in Prague. 1965 All-Union Art Exhibition “On Guard of Peace” at the Central Exhibition Hall. Exhibition of works of theater artists in the WTO. 1966 The album “Good morning” was published. All-Union Exhibition “Artists for Children” in CEH. Personal exhibition at the cinema “Fitil”. 1967 All-Union Exhibition of the works of theater artists in CEH. 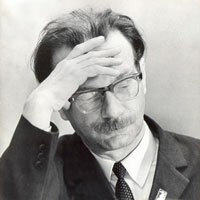 1968 – 1976 Twice elected secretary of the Union of Artists of Russia. In those years he was elected secretary of the board of the Union of Artists of Russia on organizational issues. He was one of the initiators of the first exhibition “Russian Artists for Children”. Participated in the resumption of the publication of the magazine “Young Artist”. 1973 Second International Exhibition “Satire in the Struggle for Peace” at the Academy of Arts of the USSR. The album “About big and small” is published. 1974 The album-book “My friends” was published. 1975 Fifth Art Exhibition “Soviet Russia”. 1978 First republican exhibition “Artists of Russia-children”. 1979 A new album of satirical drawings from the series “Masters of the Cartoon” was published. 1981 All-Russian art exhibition “By native land”. 1982 Exhibition of works by Moscow artists on the occasion of the 50th anniversary of the Moscow Union of Artists. 1987 All-Russian exhibition “Satire and Humor”. 1991 Exhibition of works by Moscow artists at the Central Exhibition Hall. Died in Moscow on December 12, 1991. He was buried at the Vagankovskoye cemetery in Moscow. E. Shcheglov drew in the magazines “Crocodile”, “Health”, “Funny Pictures” and others. Illustrated the books of leading writers-humorists and satirists. He designed several performances in Moscow theaters, worked for the circus, making out clown’s numbers. From 1949 to 1991, he participated in more than one hundred art exhibitions. Yevgeny Shcheglov’s works are in many museums of the country, published in his albums of genre drawings, in collections of drawings by caricature artists published in Moscow and abroad, as well as in domestic and foreign periodicals. For creative work E. Shcheglov was awarded the honorary title “Honored Artist of Russia”, was awarded the Order of the Red Banner of Labor, medals, Diplomas of the Council of Ministers of Russia. Eugene Shcheglov paints amazingly funny. His humor always comes from life, from observation, and is not invented by the standard scheme, which has been boring.